The Philistines consult how to send back the ark. (1-9) They bring it to Bethshemesh. (10-18) The people smitten for looking into the ark. (19-21)1-9 Seven months the Philistines were punished with the presence of the ark; so long it was a plague to them, because they would not send it home sooner. Sinners lengthen out their own miseries by refusing to part with their sins. The Israelites made no effort to recover the ark. Alas! where shall we find concern for religion prevail above all other matters? In times of public calamity we fear for ourselves, for our families, and for our country; but who cares for the ark of God? We are favoured with the gospel, but it is treated with neglect or contempt. We need not wonder if it should be taken from us; to many persons this, though the heavies of calamities, would occasion no grief. There are multitudes whom any profession would please as well as that of Christianity. But there are those who value the house, the word, and the ministry of God above their richest possessions, who dread the loss of these blessings more than death. How willing bad men are to shift off their convictions, and when they are in trouble, to believe it is a chance that happens; and that the rod has no voice which they should hear or heed! 10-18 These two kine knew their owner, their great Owner, whom Hophin and Phinehas knew not. God's providence takes notice even of brute creatures, and serves its own purposes by them. 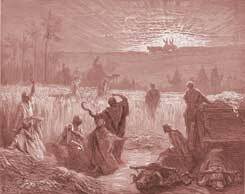 When the reapers saw the ark, they rejoiced; their joy for that was greater than the joy of harvest. The return of the ark, and the revival of holy ordinances, after days of restraint and trouble, are matters of great joy. 19-21 It is a great affront to God, for vain men to pry into, and meddle with the secret things which belong not to them, #De 29:29; Col 2:18|. Man was ruined by desiring forbidden knowledge. God will not suffer his ark to be profaned. Be not deceived, God is not mocked. Those that will not fear his goodness, and reverently use the tokens of his grace, shall be made to feel his justice. The number smitten is expressed in an unusual manner in the original, and it is probable that it means 1170. They desire to be rid of the ark. Foolish men run from one extreme to the other. They should rather have asked, How may we have peace with God, and recover his favor? #Mic 6:6,7|. Thus, when the word of God works with terror on sinners' consciences, they, instead of taking the blame and shame to themselves, quarrel with the word, and put that from them. Many stifle their convictions, and put salvation away from them. The Philistines are like so many gentiles today. They know that The Lord God of Israel is distintly different than the pagan gods they worship. They bare witness that our God is a God of great mighty works as He is very much the only One True and Living God but they much rather blidnly follow the vain superstition's of their pagan idols which neither hear see nor speak. @April you are correct. God does help whenever you are in need of something without you even asking! you are correct. Verse 19: The Israelites were not to look upon the ark because this carried the death penalty. They suffered because they disobeyed this command. Irene123 your so correct about the emerods being defined as hemmeroids. They didn't have preperation H back then. God gave the Philistine's hemmeroids, not boils. Hello, Avenger of Blood, Go el Haddam, 1 Samuel 6 2 Thank you. I wish and pray that God can also Bless me financially ,,I m struggling Lord. it is interesting that they knew if was from Israel's GOD and that HE could do things like give them emerods (boils) but not turn to GOD HIMSELF. What Do You Think of 1 Samuel 6? Where in the Bible does it refer to 'Five Golden Emerods' and 'five golden mice'?